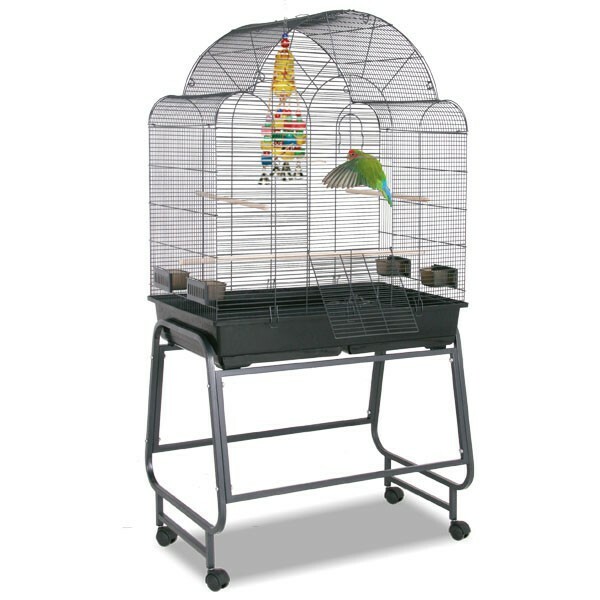 The Montana Memphis III is suitable for bird species starting with the smallest parakeets and ending with larger long tailed parakeets or other small to medium sized birds. The Memphis series are characterized by the horizontal bars on the front and back side. The elegantly-shaped three arch top, the detachable stand together with the wooden perches round out the offer. Please notice that the supplied plastic bowls are dishwasher-proof. Features 4 feeder bowls, pull out trays which provide an easy cleaning, wooden perches and a detachable stand. Memphis III is coated with the patented Avilon powder - this special non-toxic powder coating is the best choice for your parrot. links "Memphis III - Antik (Antique) Bird Cage with Avilon Powder Coating from Montana Cages"
customer reviews on "Memphis III - Antik (Antique) Bird Cage with Avilon Powder Coating from Montana Cages"
Unsere 4 Wellensittiche haben sehr schnell ihr neues Zuhause akzeptiert. Sie haben genug Platz um sogar im Käfig kurz Flüge zu machen. Zusammenbau war gut, ging aber nur zu zweit. Wir und unsere Kleinen sind sehr zufrieden.